Hi guys! I thought it might be fun to write a 'how to be an organised blogger' post as I'm always looking for new ways to remain organised and stress free whilst working a 9-5 job, maintaining my blog and having a social life. I mean let's face it, as much as we all love blogging (we wouldn't be doing it if we didn't), wel all have lives and busy schedules outside of our blogs too. I've chatted to many girls on twitter who say their main blogging struggle is to remain organised and stick to a certain number of posts a week. Now don't get me wrong, there is definitely no set rules for how often we post, it's entirely up to the individual, but I think the majority of us want to keep out readers updated with fresh posts to read week in week out. After a few twitter chats on this topic, constant scribbling of blog related 'stuff'' on post-it notes, notepads and even my diary, I decided its time to get organised. 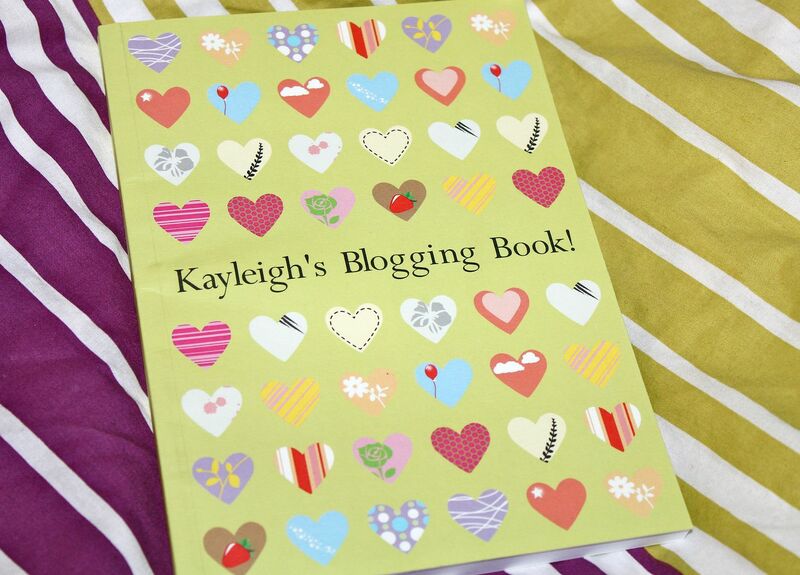 With this being said, let me introduce you to my new book for all things blogging - Kayleigh's Blogging Book! I've been meaning to buy a notebook I can dedicate to blogging for such a long time now and it's always been one of those things I've never got round too. However, after scouring around online for a website that would personalise a notepad for a reasonable price, I came across Getting Personal. Now I'd never heard of this company before but their well presented website instantly stood out to me and they offer a huge range of personalised goodies for very reasonable prices. After browsing through the endless design options (all amazingly cool by the way), I decided on this cute heart print notebook and popped 'Kayleigh's Blogging Book' on the front for a nice personal touch. I was so impressed with how easy it was to create, it literally took me minutes and even better it only cost £8.99. Delivery was super quick too and it arrived only two days after placing my order. However, the thing I loved the most about this website (you might of seen my Instagram photo already), was the amazing email they send me to confirm my order. I've popped a screenshot from my iPhone above for you all to see and I was just so amazed by how lovely and thoughtful it is. I realise that its essentially a computer generated image that has my name on it and I do realise that it will be sent to every single customer but still, it made me feel kind of special. Well done Getting Personal, I commend your company for top marketing skills! So, back to being an organised blogger. I thought that while I was showing you all my new 'blog book', I would offer a few tips on things I currently do to remain an organised blogger. These are just my tips and advice, you can take them or leave them, I realise there isn't a set way to blog and that we are all different but its always nice to share advice and help each other out from time to time. What I mean by this is to grab a selection of products you know you want to post about over the next couple of weeks and take photos of them all in one go. I usually set aside an hour or so at the weekend to do this as its the only time I can actually get some decent natural light. Once I've taken a selection of photos I'll save them all into my 'blog photos' file on my laptop so they are all ready and waiting next time I want to write a post. It saves me so much time and I would really recommend giving this a try if you haven't already. If you haven't already guessed by the fact I've bought a 'blogging book', I love to make notes. I always have some sort of pen and paper in my handbag so I can jot down any ideas for blog posts that pop into my head. I also write lists of photographs I need to take, reviews i need to have posted by a certain date, products I'd like to try and so on. The amount of things I write about is endless, anything blog related gets wrote about. I also take full advantage of the 'notes' section on my iphone so I can make notes on the go. I sometimes write posts in there too if I haven't got acess to my laptop and then I email it to myself and copy it onto my blog. I also find it really helps to have notes jotted down when I'm struggling for post ideas as there will more than likely always be a random idea wrote down somewhere. So what I mean by this is when you have a spare few hours, why not write 2 or 3 posts in one go so you have them ready to publish throughout the week? I realise some people like to be 'in the moment' when they write, myself included, but if I know I have a super busy week ahead of me, there's no harm in writing a few drafts at the weekend when I have spare time. After all, I can always tweak them and add new things on the day I want to publish the post but it certainly takes a bit of pressure off me knowing I can log into blogger and have a few posts ready and waiting to be published. If you're a full-time working lady like myself you will know how difficult it can be to find the energy to write a blog post after a long day at work. As much as I love writing my blog, if I'm tired from a long day at work, all I want to do is snuggle up on the sofa with a cuppa. However, what I've been doing lately is writing up blog posts on my lunch break. I work in an office so after I've polished off my lunch, I log onto blogger and get writing. I don't mind doing this as I find it a relaxing and enjoyable way to pass the time. It breaks my working day up nicely too and gives me something to look forward to. I'm sure most of you at some point, myself included, have thought 'I need to get that new product to blog about but I can't afford it'. I've had this thought run through my head so many times, especially when I was unemployed, and it is disheartening when you see other bbloggers posting about new products. However, what I've come to learn is that you don't NEED every new product thats released or every new collection to write and maintain a fabulous blog. There are so many posts you can write without having to spend any money and a few of my faves include favourites, outfit posts, photo diarys, nail posts, wish lists, tutorials and general chit chatty catch ups. All of these posts can be created with products you already own or no products at all which means you save yourself some cash whilst still keeping your blog updated. I always try to plan a few of these posts for those times my bank balance is looking a bit drab. So what I'm trying to say is - don't feel pressured to spend lots of money ladies, we aren't all millionaires who have Chanel coming out of our ears. Just remember that next time you're feeling a bit unmotivated to blog due to a lack of cash or new products! This one is probably fairly obvious but the worst thing we can do as bloggers is put too much pressure on ourselves to post 'X' amount of times per week. Personally, I enjoy posting 3-4 times a week, it works for me. However, if you only have time to do 1-2 posts per week, that's fine too, don't beat yourself up about it. I went through a stage not too long ago of feeling like I needed to have a new post up most days but I realised that was just impossible for me when I work full-time. You should only blog when you want to blog, don't feel pressured by other bloggers and always blog because you enjoy it, never because you 'have' to. After all, blogging is a hobby for most of us so if we can't blog for a few days or we want to take a week off, so be it. I'm sure your readers will understand and will still be waiting when you return from your bloggy break! So there we have it, my top tips for staying organised. I realise they won't all work for everyone but for me, I find them great for keeping a balance between my job, social life and blog. After all, the last thing I would ever want is for my blog to become stressful and unenjoyable. Blogging should be fun and with a little bit of organisation in place, it will remain that way. I hope you enjoyed this post (sorry its a super long one) and if you have any other tips or advice you can share, please do leave a comment below! Love this post :) such good advice! Im trying to get into the habit of taking my photos in bulk now - so much easier! I have to blog through my dinner as well! Fab post! I love this post! & your book is so cute.. I have a 'blogging notebook' it makes it easy to keep up to date! I loved reading this post Kayleigh - I'm fairly new to blogging so it's always great to hear other bloggers' tips. My friend bought me a personalised blogging note book for Christmas so I've been using this a lot. I definitely agree with making the most of your lunch break and have been known to write up posts at work. You've got to make the most of your time as a blogger and full time worker! I'm new to blogging and this is super helpful. I already have a notepad I've assigned to blogging but it's nice to hear another blogger, particularly an established one make a point about not worrying about spending lots of money. That's not what blogging is or should be about. I totally agree with the last point of it being a hobby and to not put pressure on yourself!! It should be for the fun of it and because you want to.. Well said! Great post, it's lovely to hear other bloggers tips, really makes you think what you can improve on, and sometimes realise you're being too hard on yourself. I love the bit about not needing to buy everything new, I'm job hunting and having this problem at the moment, it's making me determined to get more lifestyle type posts up! Great Advice hun! I have been trying to bulk blog! Makes it so much easier when you just schedule some posts for the week when you know you're going to be busy! Lovely post. I always take photos in bulk. It is the best way to save time and I find it very relaxing :) I also edit photos in bulk and draft posts with photos only. This way I can always see what products I have to review soon and once I am ready, I add content. Thank you so much for this post! This made me feel so much better because I also have a blog and I feel so pressured to post. You're right...bogging should be very enjoyable and I should remember that :-) Thanks, Kayleigh! Such a great post! My New Years resolution (or one of them!) is to do more with my blog! I'm currently working on adverts and business cards to get the word around and writing up drafts through the week and setting time aside at the weekend to do look books and product photos. I do agree also that you don't need a lot of money to blog or make YouTube videos. I used to blog when I was unemployed and I always thought it was a nice way to distract me from the doom and gloom of not being able to find a job. I don't have fancy high tech things to take photos as long as you know how to use a camera then it's simples! Adored this post as I'm new to blogging and still need to get into the habit of updating my blog recently, thank you so much for the advice, but there is one question that is so important. Where did you get your BEAUTIFUL notebook from, and how did you get your name on it? I would die to have a notebook like that, as I am a bit of a stationary lover, if you can reply that would be amazing! If not, thank you for reading and still love your blog! Lovely post with some great tips. those are some great tips, I need them because I've been slacking on my blog lately because life has been so busy! I'm definitely going to use some of these, thanks! Great post! Especially for beginners like me! I'll definitely take some of these tips into condsideration! I already keep a blog book myself and find it really useful so that i dont forget good ideas that icome up with, Really good tips tho! Thank you so much for this post. As I'm a new to the blogging scene these tips will really help. I will definitely keep all your suggestions a go! I always seem to think of blog post when I'm trying to sleep and as soon as I wake up in the morning I forget it, it's so annoying... Therefore I will also buy a notebook, yours is so cute. thanks for making this post i really appreciate these tips! you are so successful compared to me and I admire you and your advice!! Brilliant advice Kayleigh. The notepad is super cute and I love the personalised email, that's a great touch - very clever marketing! I absolutely loved reading this post. I'm considering ordering one of these notepads to get me more motivated/organised. This post really did help me a lot, I'm a uni girl so I have a lot of deadlines to meet/work to do and it really took some of the pressure off, so thank you. I'm sure so many other blogging girls would appreciate this post too. 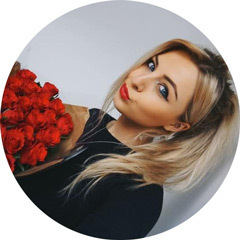 I've loved reading your blog recently, the layout, the content, the photographs...everything is perfect. This is an excellent post! As a blogger only just returning to the scene, I was a little disheartened by not being able to spend stacks of money on products to try out because I'm saving for a house, but you are right, there are so many other things to blog about. You can get as creative as you want! I really needed to read this! I have a hard time setting time aside to do blogging and feel bad when I can't post as often as I want too. Thank you for the awesome tips and reminding us that it is ok not to have every new product that comes out. ive JUST set up my blog tonight & this post has helped me soooo much! love the bit about not needing to spend money.. i'm a student & was panicing thinking about all the new products I was going to have to buy!! This has really helped me- just what I needed, thanks lovely! oh I love the concept behind you book! Thanks for the tips! Having an internship and getting into blogging was not easy, i found it hard to find the time to edit photos and blog, I was worried about finding the time to blog especially since school is starting and i'll probably have a really heavy curriculum. Thanks for sharing :) Shall attempt to put your tips into practice! Especially number 3 and 4!